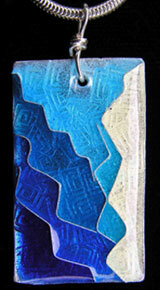 Fused glass jewelry by Kathleen Cool of Chicago. Work by more than a dozen artists from the Evanston and Chicago area will be featured in an Accessories Show from 10 a.m. to 6 p.m. March 19 at the Evanston Hilton Garden Inn, 1818 Maple Ave., Evanston. 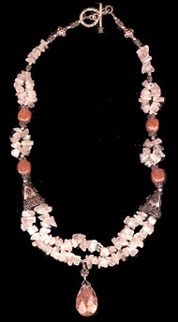 TTThe show originated with four local jewelry designers  Susan Franke, Michelle Duster, Callie Seymour and Kathleen Cool, who each uses a different technique in creating her jewelry. With that variety as a starting point, the idea of an accessories show evolved. TTAll work in the show is hand-made and one-of-a-kind, with attention to a high level of craftsmanship. In addition to jewelry, scarves, purses, wall art, mosaics, pillows, clothing and other items will be exhibited. TTThe Evanston Hilton Garden Inn is located near the Century Theaters, with free parking available in the lot next door for the first hour. A piece of enamel and cloisonne jewelry by Susan Franke of Evanston. 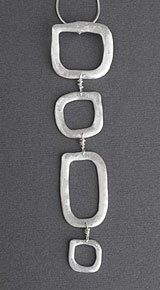 A piece of fine silver jewelry by Callie Seymour of Streamwood. Bead artistry by Michelle Duster of Chicago.